Down in the sewers, Leo, Don and Mike spot a magic sword. As Leo lifts the sword up, the three Turtles suddenly find themselves transported to another time and place; a mystical world of swords and sorcery! In the process, they have been transformed into Savage Leo, Dwarf Don and Knight Mike! They’ve little time to ponder their predicament, as they hear the sound of battle. Not far away, Warrior Bebop and Gate Keeper Rocksteady are attacking a feeble old wizard. 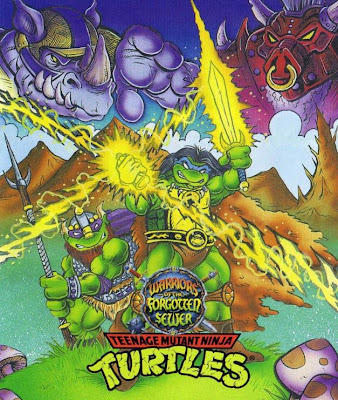 The Turtles rush to his rescue and send the villains into retreat. The Sorcerer turns out to be Wizard Splinter (who knows nothing of this “Master Splinter” they mistake him for), guardian of one of the four Golden Turtle Statues. If the four statues are ever united, their magical power could destroy the world (or they could be used to return the Turtles home; whichever). Giving the Turtles a steed in the form of the ferocious Sewer Warcat, Wizard Splinter charges the TMNT with collecting the remaining three statues before an Evil Knight and his minions do (wonder who that might be). *This comic came packaged with the four action figures released as part of Playmates’ Warriors of the Forgotten Sewers line. 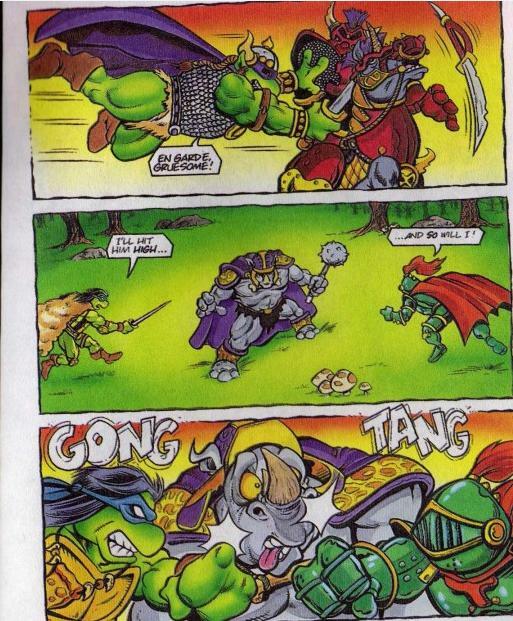 Though they appear in this comic, Knight Mike, Wizard Splinter and Sewer Warcat never received toys. Presumably, they along with a Raphael toy and a Shredder toy would have been released in a follow-up to this line (Sewer Warcat and a variant of Savage Leo were promoted in the accompanying catalogue but never released), but nothing ever materialized. *Obviously, a second comic was never produced. Thanks to all the Turtle fans out there with scanners and patience (particularly those at The Technodrome Forums), I’ve managed to read a lot of these old pack-in comics. While some are pretty lousy, the best of the bunch rank as a “neat” which is the most you can expect from a toy pack-in strip. 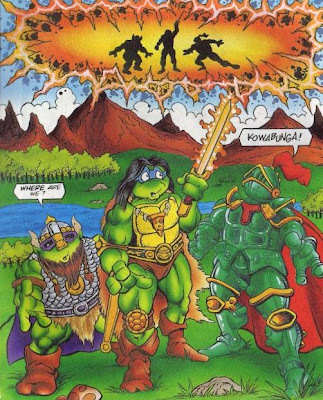 Coming out in 1994 as the TMNT line from Playmates was spiraling into its death-throws, "Warriors of the Forgotten Sewer" was a rather… incomplete sub-line. Not even all the characters in this comic got figures and some didn’t even warrant an appearance at all! I guess Raph had better things to do. While not all these comics had easily identifiable artists (and as is still the practice with this sort of thing, writers and artists are not credited), this one is clearly the work of Dan Berger, whose style is a cinch to spot. I’m quite a sucker for his work and I always wished he’d had a chance to do some issues of Archie’s TMNT Adventures title. His work on Mirage’s Tales of the TMNT (Vol. 2) was always a treat, but his style seemed very suited for the lighter Fred Wolf and Playmates universe of the Turtles. So seeing him take a whack at that universe, even if only in a 10-page minicomic, elevates the thing for me. I feel kind of stupid critiquing the “story” to this thing, since as a rule toy pack-in literature exists only to give kids a general idea of the kinds of adventures they could have with their new action figures. I generally didn’t care for any of the “goofy” versions of the Turtles from Playmates, even as a kid. I mean, what kid would possibly want something as insipid as “Birthday Party Leo” or “Circus Clown Michelangelo”? What the Hell could they possibly do with a toy like that (except maybe follow a storyline that sees Mike possessed by the ghost of John Wayne Gacy)? On the other hand, "Warriors of the Forgotten Sewer" grants us all the opportunity to see the Turtles with hair. I hope you all enjoyed that. Dan Berger's art really does elevate this rather pointless exercise in toyetics. Glad it flitted across my scanner and landed a review!